July was good. August a little better for South Sound home sales. Here is the report from News Tribune writer about Pierce County home sales. The Gig Harbor and Key Peninsulas didn't fare quite as well for the median sales price uptick year-over-year but do show a solid 5% upgrade for year-to-date figures — just a tad lower than the county as a whole. BY ROLF BOONE Staff writerSeptember 4, 2014 Pierce County single-family residence data for August 2014/2013 -Sales rose 1.55 percent to 1,176 units from 1,158 units. -Median prices rose to $239,950 from $230,000. -Pending sales rose 4.5 percent to 1,454 units from 1,391 units. -Number of single-family residences for sale rose 12.5 percent to 3,967 units from 3,527 units. -New listings in August fell to 1,480 units from 1,505 units. Pierce County condo data for August 2014/2013 -Sales fell 4.3 percent to 88 units from 92 units -Median prices fell 5.3 percent to $154,500 from $163,200. -Pending sales rose to 96 units from 95 units. -Number of condos for sale rose 3.7 percent to 251 units from 242 units. -New condo listings in August rose to 111 units from 93 units. Source: Northwest Multiple Listing Service The South Sound housing market continued its upward trajectory in August, with monthly home sales rising to new highs for the year, according to Northwest Multiple Listing Service data released Thursday. Pierce County home sales rose about 1 percent to 1,264 units in August from 1,250 units in the same month last year, while Thurston County home sales rose more than 3 percent to 373 units from 361 units in the same period, the combined single-family residence and condo data show. The number of homes sold in both counties were highs for the year, the data show. Median prices also rose in both counties, up slightly more than 4 percent in Pierce County to $235,000, while Thurston County rose nearly 2 percent to $239,000. King County's housing market, meanwhile, ran headlong into the realities of not having enough homes for sale. Home sales fell nearly 7 percent in August, while median prices inched up about 1 percent. The challenge? King County has only a two month's supply of homes for sale, the combined data show. And that's increasingly the challenge in Pierce and Thurston counties. Although the number of homes for sale rose nearly 12 percent in Pierce County and 5 percent in Thurston County, that still equates to less than a four month's supply of homes on the market at the current pace of sales. For August, the months of inventory was 3.34 months in Pierce County and 3.83 months in Thurston County, the combined data show. But Mike Larson, president and designated broker of Allen Realtors in Lakewood, wasn't too concerned about the lower inventory level in Pierce County because at one time a two-and-a-half month to three-and-a-half month's supply of homes was once considered the norm. "It's slow and steady and trending in the right direction," he said about the market. "Balanced and moderate is a lot better than the ups and downs we saw for years." But Steve Pust, a managing broker at Van Dorm Realty in west Olympia, has noticed the lower inventory level in Thurston County, saying buyers in the market are having trouble finding a home, he said. That has resulted in some multiple offer situations, Pust said. Low levels of inventory typically pushes median prices higher, but the county still has about 60 bank-owned home sales a month, and not every buyer can qualify to purchase such a property, he said. In that situation, banks get very particular about the type of buyer they want, shutting out contingency buyers — those selling a home while trying to buy another at the same time — or requiring that their financing be in order, Pust said. If inventories get leaner, sellers will drive median prices higher, he said. Foreclosures are down from a year ago–both state-wide and nationally. CoreLoic released figues recently with1.6% of the homes are in some state of foreclosure. That tracks closely with the national number of 1.7%. Still the number of homes in the foreclosure process is four times as high as the early 2000's. And nearly 35% of all homeowners are under–water on their mortgages–meaning they have less than 20% equity in their home or could not sell and have enough money for a down payment on another home. Gig Harbor homes fared even better with foreclosures and short sales only 6.5% of sales for the month of July. Distressed sales for Gig Harbor homes totaled 23% of everything sold in January. And for Key Peninsula it hit 70% of all sales. This was a total of 15 properties–all but two were bank-owned. Figures from the National Association of Realtors® show distressed homes rose nationally to 36% of sales of existing homes in December, up from 33% in November and 32% a year ago. Such homes are typically discounted by 10 to 15 percent, according to NAR research. 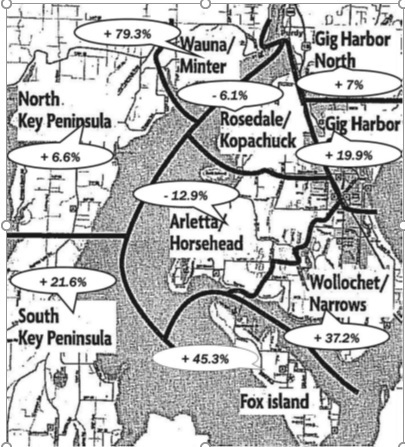 Local figures show an increase from 2009 in distressed properties for Gig Harbor homes as well. Gig Harbor is up 6% in the 4th quarter of 2010 compared to a year before…that is 31% of all homes that closed in the three month period. Key Peninsula was up 17% during that same time to a high of 56% of all closings. Recently reports indicated the Greater Seattle-Tacoma-Bellevue area’s foreclosure rate jump 23 percent from a year ago, second only to Houston. Regional experts believe that as our economy and unemployment improves, our market will recover more quickly than Florida, California, Arizona, and Nevada, because they have been in a deep trough longer. Snohomish and Pierce counties are currently experiencing the highest rates. And Seattle Metro prices dropped 6% from a year ago in December, which backs up the discounting of house prices due to distressed home sales. I would anticipate the Boeing award for the Air Force fueling tankers will help pull up the local economy up more quickly. Most foreclosures now are being caused by unemployment and economic displacement, rather than bad loans and overheated values. But many of the 5 year ARM loans taken out in the heat of the 2006 housing bubble are coming due this year. Another record year for foreclosures is forecast which no doubt will drag house values down even further, pushing other homeowners into negative equity territory. It could be another five years to completely purge the housing inventory. Assets are being kept in weak hands longer as this becomes a long tedious market correction. Distressed properties currently make up 29% of all listings in Key Peninsula and 19% of all listings for Gig Harbor homes. 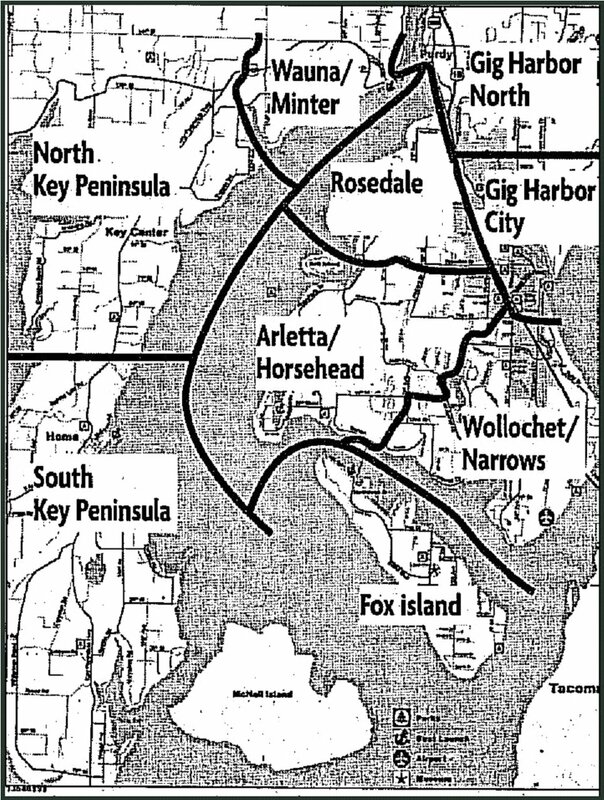 Two-thirds of Key Peninsula distressed homes are already owned by the bank where just 44% of the distressed inventory for Gig Harbor homes has been taken back thus far. However there is a large “shadow inventory” of bank-owned properties not yet on the market. Lenders are obligated to not flood the market. Largest inventories are currently found in North Key Peninsula at 39%, Fox Island with 34% and Wauna/Minter at 32%. The largest impact by price range is under $300,000 where 72% of January’s closing was distressed, and where 38% of all homes on the market fit this price range. This makes it very difficult for sellers, not in a distressed situation, in these price ranges to compete for buyers. Realty Trac, nationally foreclosure reporting service just this week noted that foreclosed properties are sometimes selling for a 28% discount over non-banked owned.